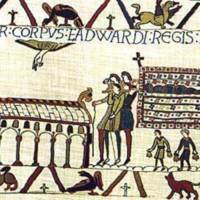 The funeral procession taking the body of King Edward the Confessor (d. 1066) to Westminster Abbey, as depicted in the Bayeux Tapestry. The Latin inscription at the top says: Hic portatur corpus Edwardi regis ad ecclesiam sancti Petri ('here is carried the body of King Edward to the church of St Peter the apostle') since the church of Westminster abbey was dedicated to St Peter. The Bayeux Tapestry depicts some 50 scenes from the conquest of England by Duke William of Normandy in 1066, after King Edward died without an heir. It was probably commissioned by Bishop Odo, Duke William's half-brother, and likely embroidered by a group of women in England, even though the tapestry is today located in the Norman city of Bayeux (France). “Westminster Abbey depicted in the Bayeux Tapestry,” Medieval London, accessed April 22, 2019, http://medievallondon.ace.fordham.edu/items/show/8.